Bundobust is easily one of my favourite bars in Leeds; the atmosphere is great, the drink selection vast, and there’s a remarkable variation in clientele that makes it impossible for anyone to feel out of place. But for all my visits I’ve only ever snacked on the odd dish here and there; it was only recently that I went for a proper meal and got to sample a decent portion of the menu. The vegetarian aspect has always been a problem; I have no issue eating veggie but on several occasions I’ve met resistance from stubbornly carnivorous dining partners. Just a few weeks ago I took a friend along who, upon realising the menu was meat-free, glared at me as if I had committed an act of great treachery, finished his beer and announced we were going for burgers. Last weekend I had a dinner date with my parents, and after singing Bundobust’s praises for weeks finally convinced them to give it a try with me. It was busy when we arrived but as we got our drinks a table became available and we swooped in, claiming it stubbornly with our beers. I’m not a huge fan of beer (the most I can generally stand is a light European lager) but Bundobust do a beautiful mango beer that I’m a little in love with, plus the glasses are super cute! 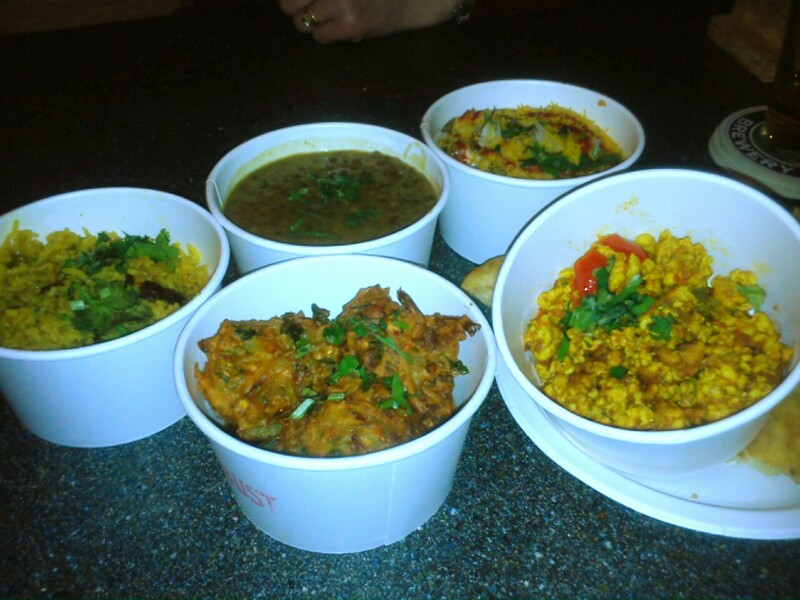 We weren’t in the mood for an absolute feast so we ordered five dishes between three of us, opting for veg rice stir fry, onion bhajis, Bundo chaat, egg bhurji and dhal lentil curry. 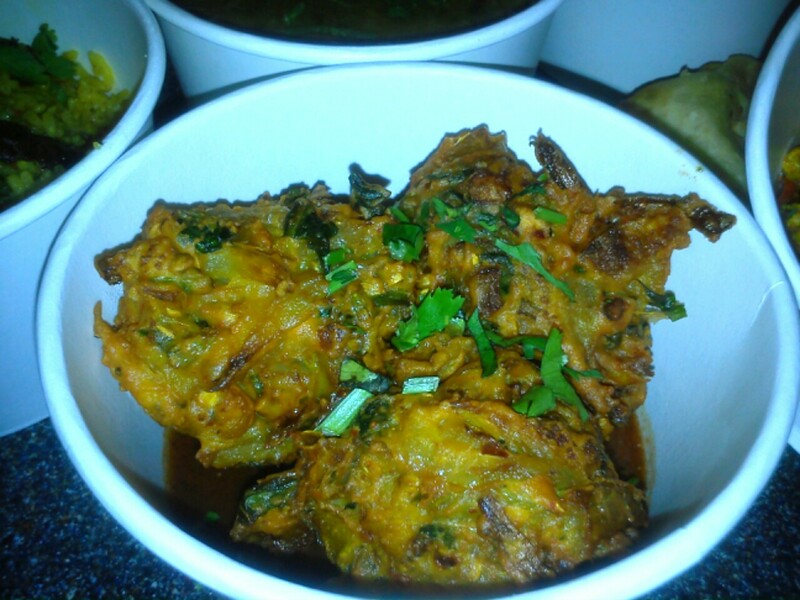 I felt pretty god about our choices; the dhal, while not the most appetising of colours, turned out to be spicier than I expected and packed a real punch, while the onion bhajis came with a gorgeous red pepper chutney that I scraped eagerly out of the bottom of the tub. Our rice dish was packed with fresh vegetables that kept it from being bland, and the bhurji was a real surprise; I generally can’t stand egg in any form but somehow this didn’t taste or feel anything like egg. 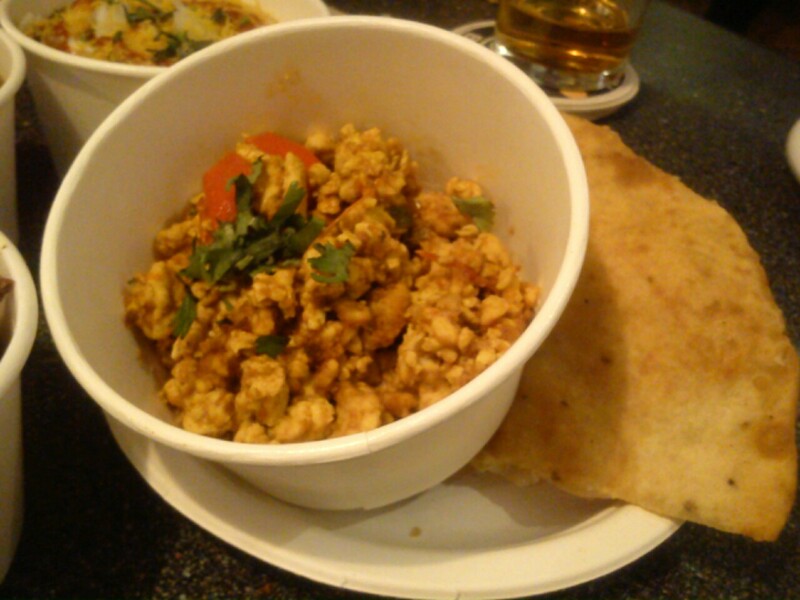 The texture was light and fluffy, and it came with a side of flatbread to make tiny egg sandwiches (it also came in handy mopping up the bhaji chutney)! 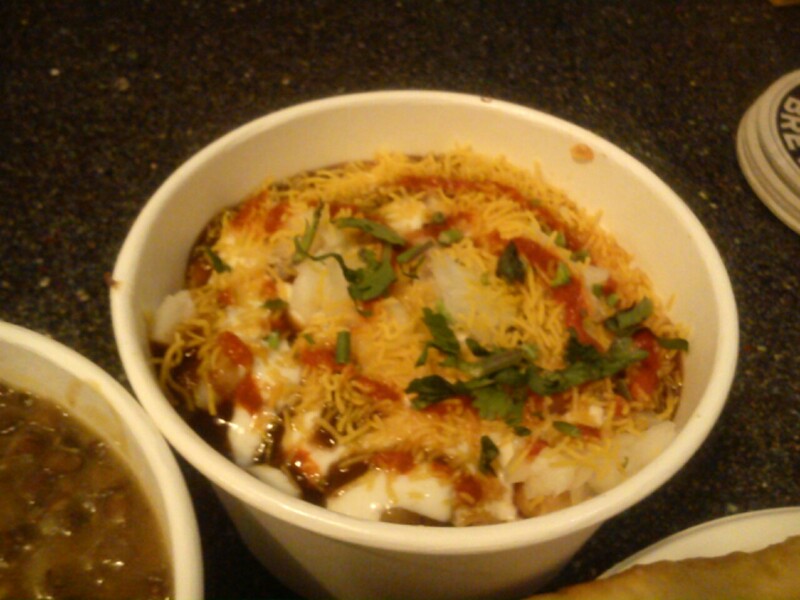 My only regret was not ordering a second batch of chaat – it’s my go-to snack and favourite thing on the menu, and it soon became apparent that it was everybody else’s favourite too.